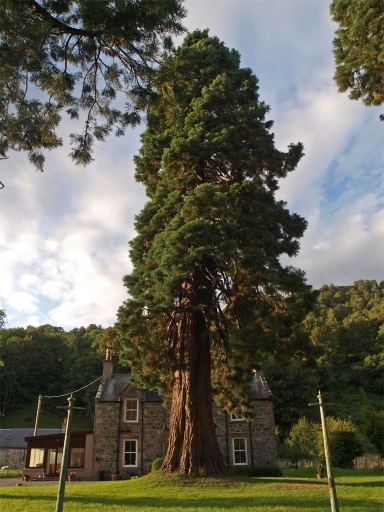 Thanks Tam for finding these three Giant Sequoia near Drumnadrochit. Tam says "On the road to Urquhart Castle travelling through the village of Drumnadrochit I found another three Giant Sequoias. They are in the grounds of Kilmichael House which the owner told me had once belonged to a local doctor. 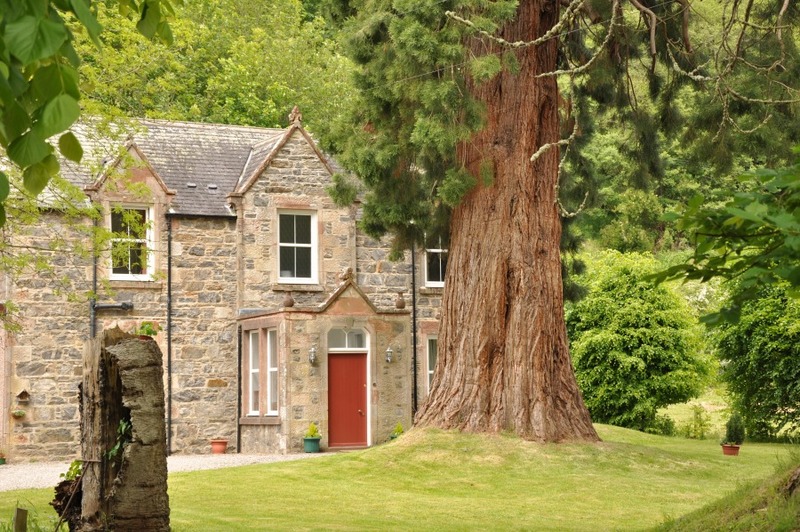 I logged on to NHS Highland and the site there had the following info:"
"Dr David MacDonald, a native of Beauly, set up practice in Drumnadrochit in the late 1880s. He lived in Kilmichael House, his surgery was a wooden shed at the back of the house. Dr David did his rounds on horseback. He had two horses for this purpose. The upkeep was 15/- per horse per week. In later years he drove a motor car, a Swift, which was purchased for him by the community. Dr David was the first person in the Glen to drive a motor car." Tam continues "The owner told me that there had been a fourth at the back of the house but it had been cut down a few years ago and then she helped me to measure the trees which are in the front garden. The one right in front, nearest the house measures 7.88m. Of the other two - in the 2nd photo the left hand one is 7.33m and the right hand one is a huge 8.30m. " Well done Tam for obtaining some history surrounding the trees and their location. 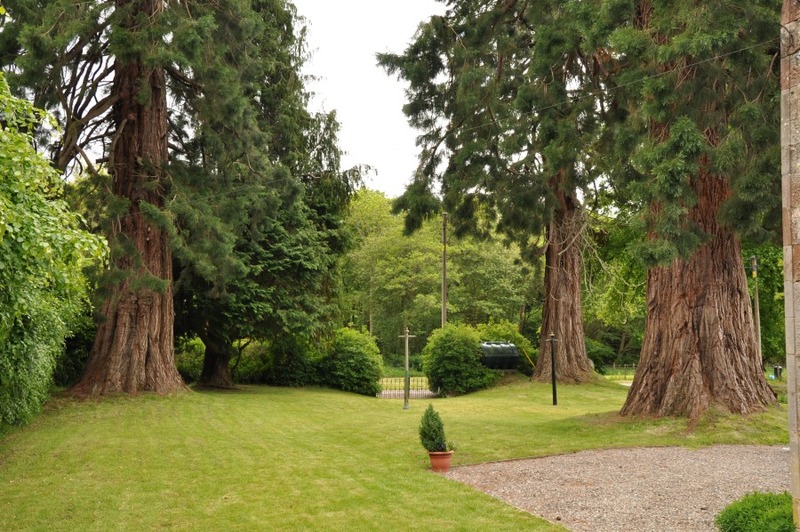 I have found that owners are rarely other than friendly and are happy to supply details of their trees. 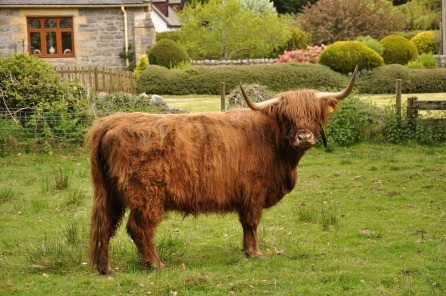 Well, who would not be proud to have such marvellous living monuments on one's doorstep! 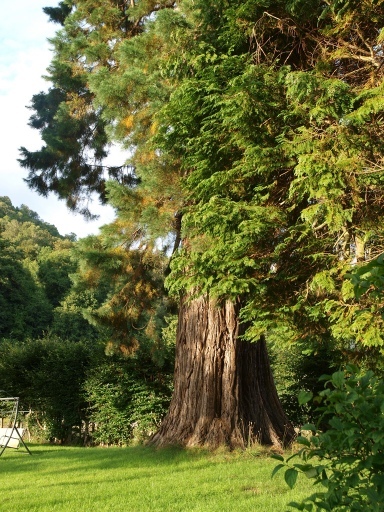 Peggy sent more photopgraphs of the Redwoods at Kilmichael House. She says they are quite close to the Redwoods at Corrimony. Peggy's coordinates for the location are N 57º 19.896 W 004º 42.002. 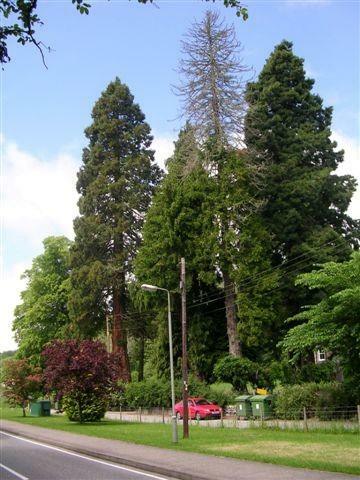 Driving through Drumnadrochit it was a pleasure to stop and get a closer look at these three Giant Sequoia for myself. The friendly owner of this Bed and Breakfast was suitably proud of the Redwoods and was happy to have them measured and photographed. The girth measurements appear to correspond with those of Tam's from 2007. 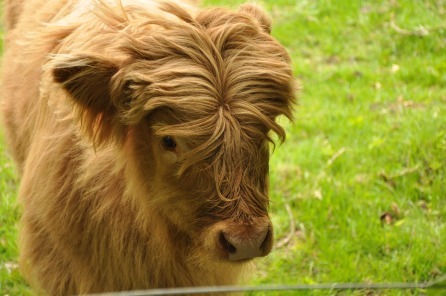 An inquisitive highland cow and her calf watched from the field next door.